… see, I like my other Réalisation Par dresses, but I love my Amelia dress. Not convinced? That’s because you don’t have an Prada backpack Amelia dress. No idea what I’m talking about? 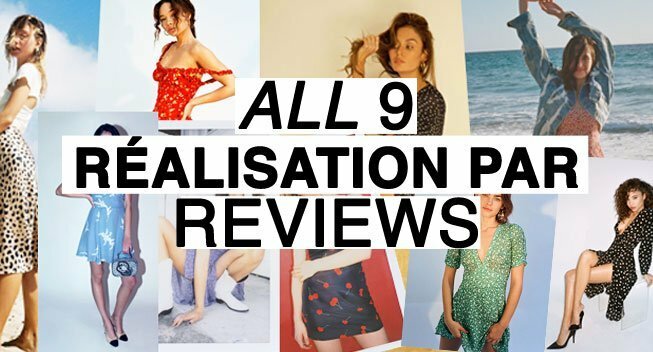 Watch 10 Things I Hate About You then continue on to the rest of my Réalisation Par Amelia dress review. My Amelia dress is a size extra small (XS). This is the same size as my most of my Réalisation Par dresses. I normally wear a US 2 in Reformation, a FR 36 in Rouje, or a UK 8-10. On my 5’5.75” and 115-117lbs frame, the Amelia comes down mid-shin. The Amelia in XS is the same length as an XS Violette or Teale dresses. I had a lot of concerns about the Amelia’s corset style top after my Christy dress (size S) was too loose. With the Amelia in an XS, the bust is perfect. The Amelia’s top hugs, but doesn’t flatten your chest. It lifts, but doesn’t over squeeze. This is mainly due to the slightly curved stitching that they added up the front. … and the bottom of the dress is bias cut which means that it is tailored to wrap around and accentuate your best assets. Looking for Something Similar But Different? Check out these slips that are similar to the Amelia, but in different prints… I love that daisy print on the first one! –Adjustable Straps: Unlike Réalisation Par’s Juliet dress, you can adjust the straps on the Amelia. This way you can choose how low it is or how high it is. –Bias Cut Bottom: Super flattering. –Corset-esque Top: The top amplifies and smooths (but doesn’t flatten) your chest. –Sheer: The Amelia is not lined and in “Nudité” you need skin-tone underwear. The Amelia dress. It’s like the Emilie but with our signature silk for ease and a bit of length for flow. The length and silk crepe allows it to move easier than the Emilie or the Christy. You don’t feel restrained in the Amelia. Putting it on is like falling in love. Falling in love is an indescribable feeling, you simply know when you’re in it. I had no idea how the Amelia would look or fit when I ordered it. Once I slipped it on, I knew that this was the Réalisation Par dress I’d been waiting for. It’s weightless, flirty and committed to embracing your best assets. It’s super light, has the sweetest print, and flatters every millimetre of your body. From the bias cut to the subtle floral print, it’s the dress that “those damn Dawson’s River kids” would wear and it’s the one that fulfills all of my 1990’s high school daydreams. It’s simply too good to be true… and no one will be able to take their eyes off of you in it. The Amelia dress is available from $210 USD in three prints from RealisationPar.com. Sometimes Réalisation Par dresses are listed on The Real Real. You can get $25 off your first purchase with my referral code and save money and the environment by buying it secondhand. -Take your normal Réalisation Par size for the Amelia, but size up if you have a bigger bust. -Réalisation Par’s return process can be a bit time intensive, here‘s what to expect. -Réalisation Par offers discount codes several random times a year. They’re generally for 20% off everything.